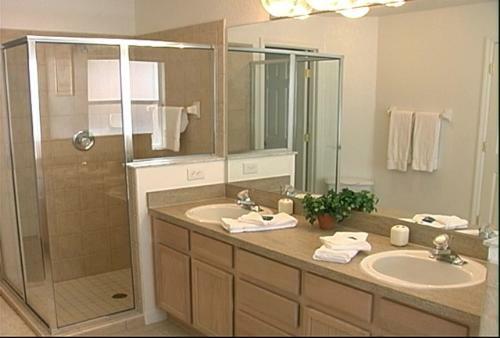 4 bedroom, 3.5 bathroom villa in the The Abbey at West Haven community. Owned by John Barclay. Ref: 779. 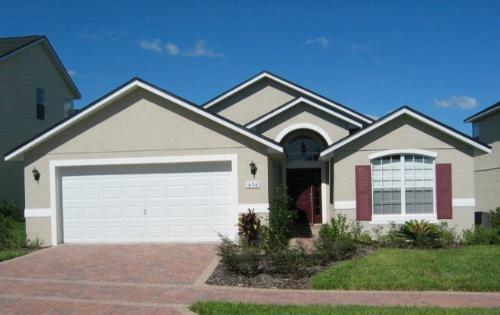 Luxury home on a prestigious gated community overlooking conservation wetlands. Beautifully furnished to the highest standard this 4 bed roomed ( 2 master suites) home has many upgraded features and offers the ideal accommodation for any family including wireless high speed internet and games room. 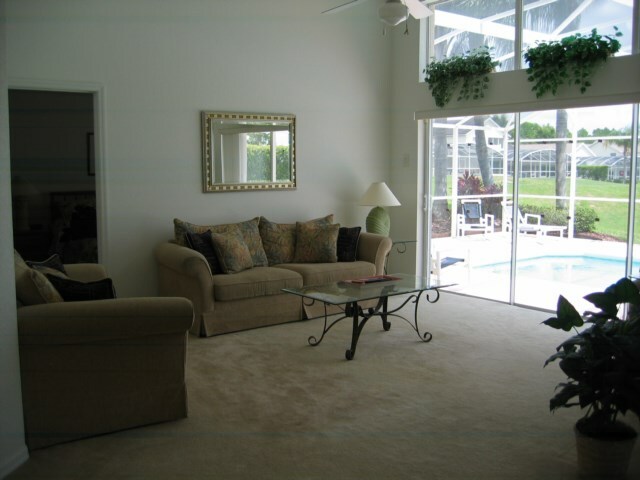 Champions Gate golf course is minutes away where you will find excellent shopping, dining and other amenities. 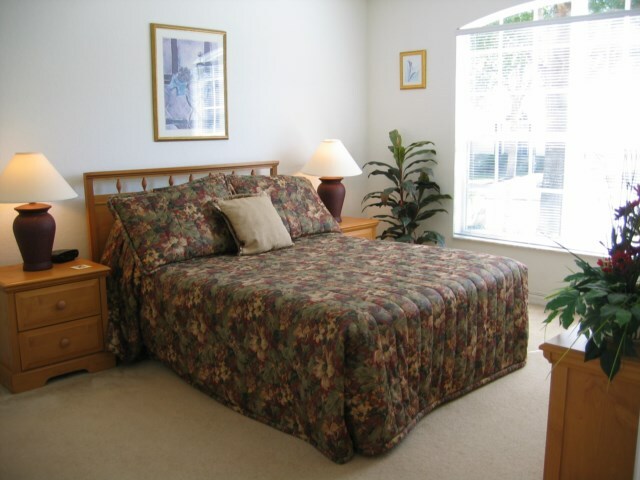 10 minutes from Disney the location offer the perfect blend for theme parks and relaxation. 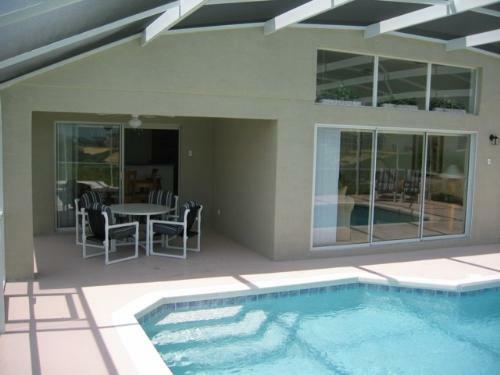 Fully screened 28ft pool, 7ft spa, with underwater lights, enjoying day long sunshine on the large extended deck. 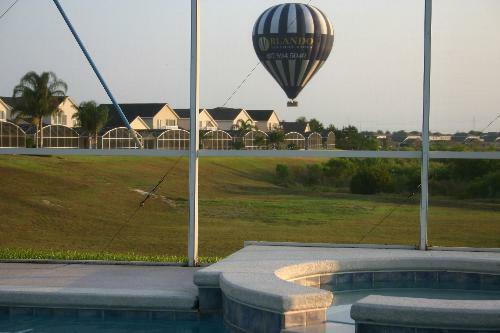 Panoramic views over beautiful wetlands this is the perfect place to relax. We think you will agreed that this is indeed something special. 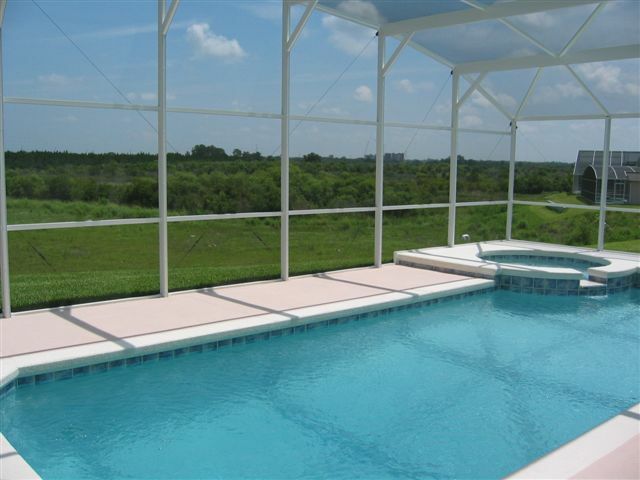 Pool, Spa and Lanai – The large deck benefits from day long sunshine and has been extended offering ample space to relax. 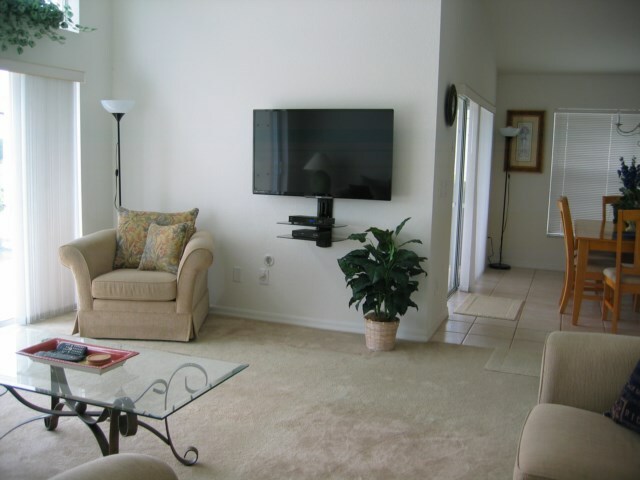 Equipped with loungers, reclining chairs, foot stools & bathroom facilities including a cabana shower. There is a waterfall running from the spa to the pool. Looking for shade, the Lanai is furnished with a dining table and chairs, electric fan, light and power.Fully enclosed within a pool screen. All of this overlooks mile after mile of beautiful scenery which is protected from further development and offers a high degree of privacy. Lounge – Luxurious family lounge that overlooks the pool and wetlands beyond, which has been fully furnished and includes a Smart 49ins. 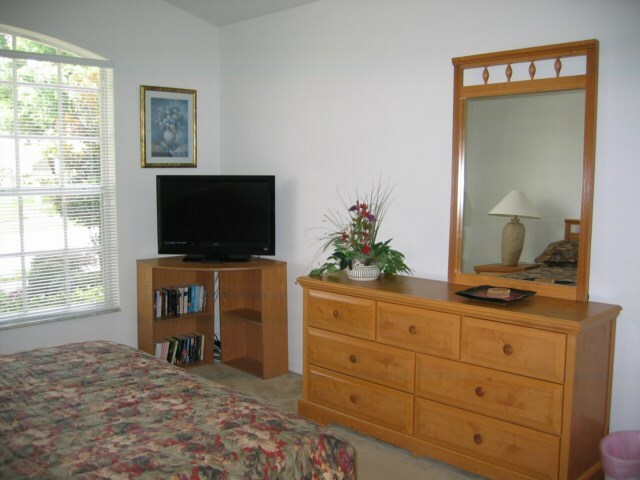 flat screen digital cable TV and DVD player. There is also an i-pod docking station. 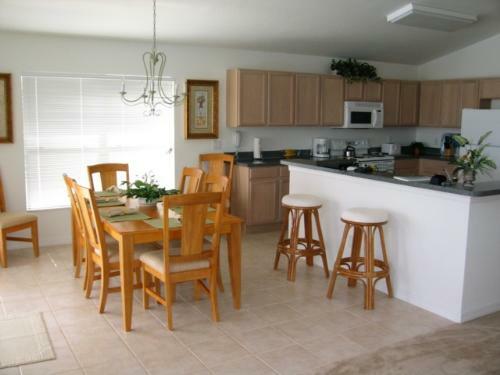 Dining and Kitchen – Spacious dining room includes a large table and 8 chairs. 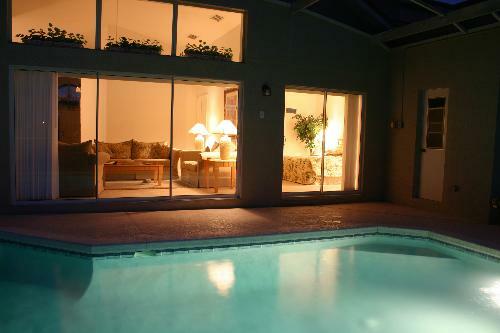 It is next to the kitchen and overlooks the pool. A breakfast bar and stools provides an informal eating area that separates the dining room from the kitchen. 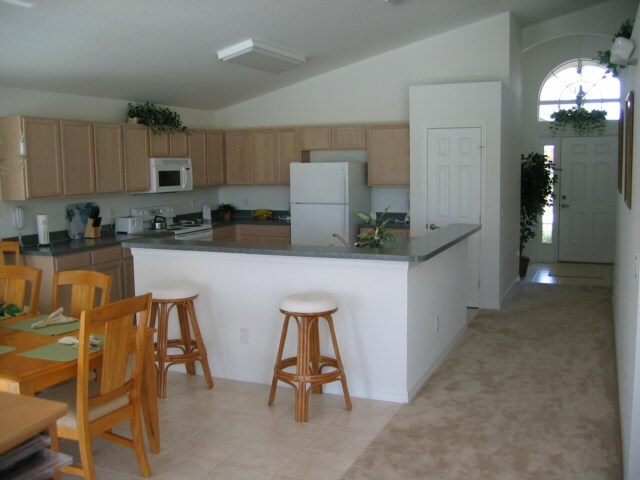 The kitchen is equipped with all you could want for indoor and outdoor dining including a toaster, blender, microwave, etc. 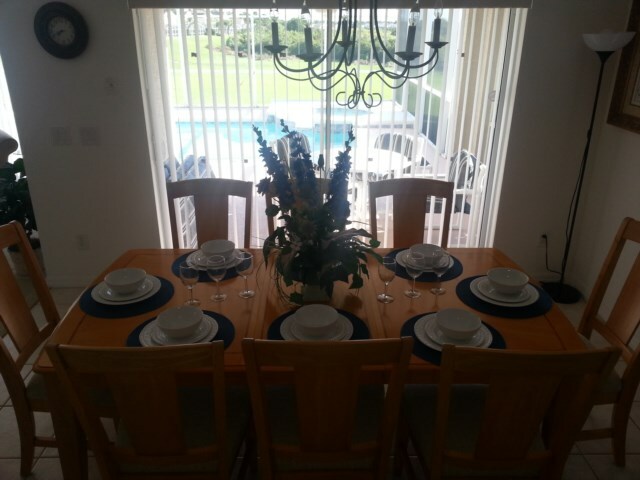 Master 1 Bedroom –With wonderful views over the pool to the countryside beyond this room has been furnished with a sumptuous king-size bed, flat screen TV and has personal access to the pool deck. A very impressive en-suite bathroom includes a deep tub, large shower cubicle, his and hers wash hand basins and a large walk-in wardrobe. Master 2 Bedroom – Furnished to the same high standard as Master 1 this room has a Queen Size bed, flat screen TV, walk-in wardrobe with safe and en-suite bathroom including a shower. 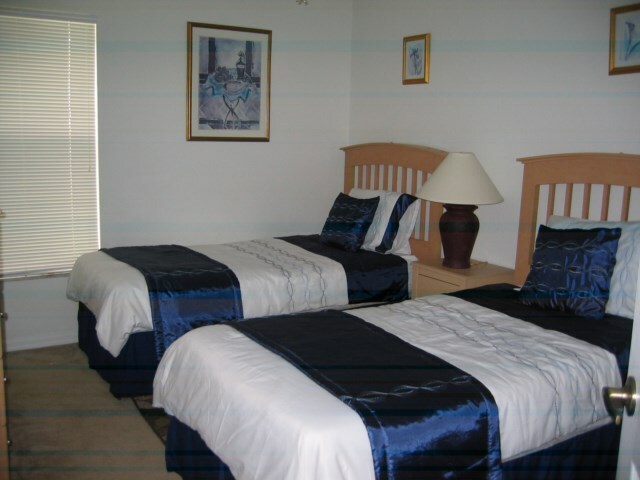 Twin Bedroom - Furnished with two single beds, large chest of drawers and wardrobe. Also has cable TV, games console and portable CD/radio. 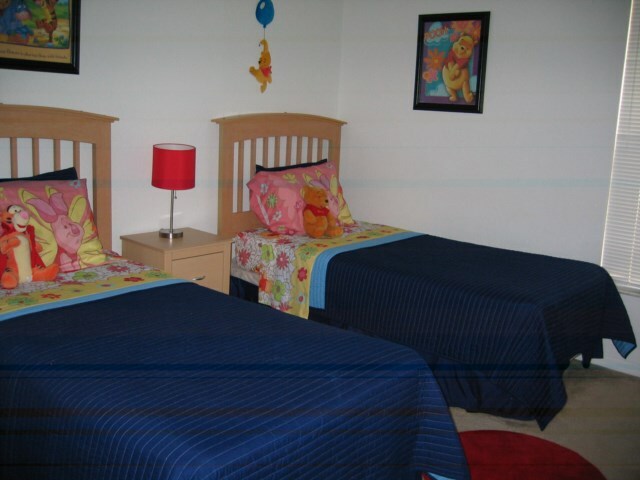 Disney Bedroom – As Twin room with the added attraction of a Winnie-The-Pooh theme for our younger guests. 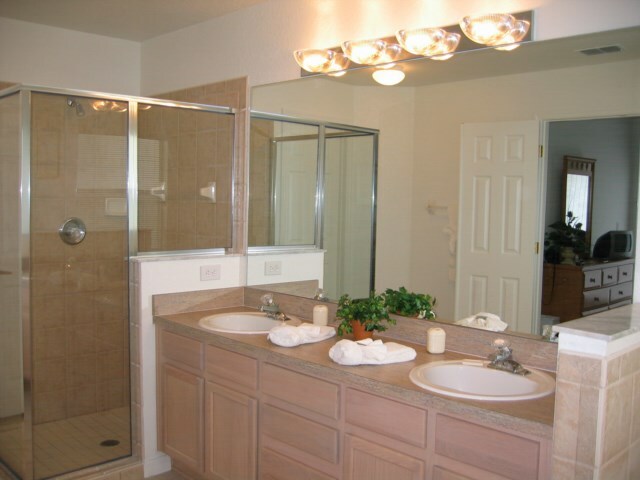 Both Twin rooms share a beautifully fitted family bathroom that includes bath with shower. Facilities for Children - There are no stairs or steps inside the property. Access to the pool and spa deck is fully alarmed. High chair & cot are available locally through the Management Company. And of course there is the themed bedroom. 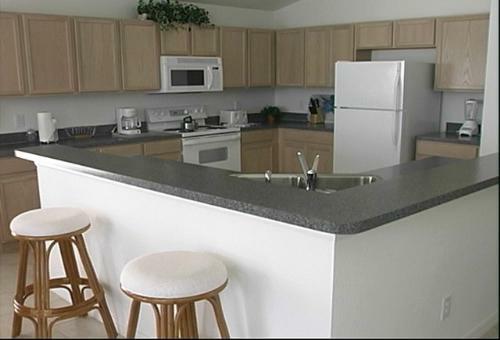 Other facilities – Utility room equipped with heavy duty washing machine, tumble dryer, iron & ironing board. 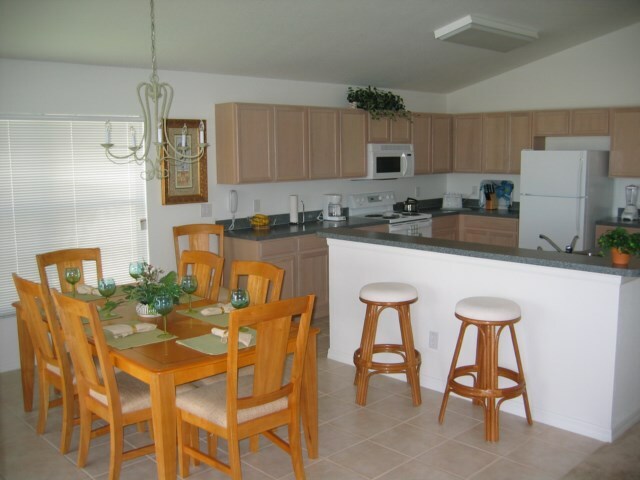 The house is fully air conditioned plus the additional benefit of 6 ceiling fans. Emergency lighting system, a phone providing free national calls within the US and Canada. Free Wi-Fi. En-suite bedrooms are provided with hair dryers and straighteners. 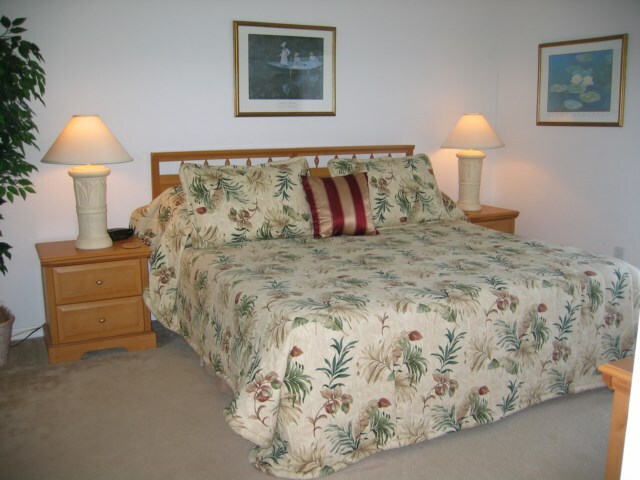 There are ample towels, hangers in the closets & spare bed linen. 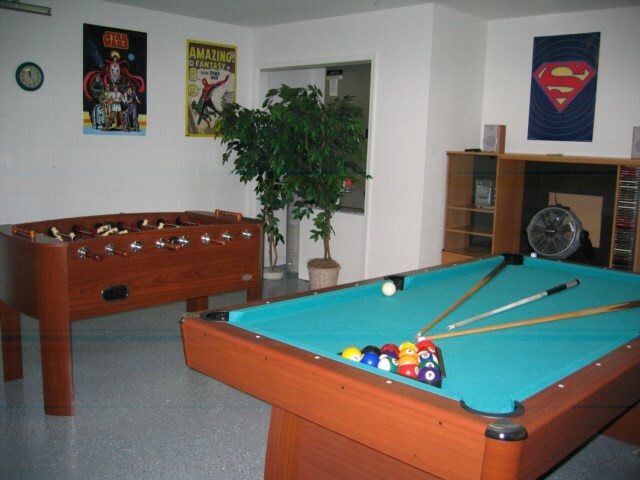 Games room containing pool table and table football. A gas BBQ is available locally through the Management Company. Keys are located in a lock box by the front door for immediate access. Assistance with car hire, flights and attraction tickets is also available if required. As bookings are taken well in advance discounts are not available. Bookings of less than one week are subject to an $80 cleaning charge. Your enquiry will be sent to villa ref 779 only. This page has been viewed 11860 times since 25 Jun 2003.